Visa has launched a Facebook application for small businesses. The first 20,000 US businesses that download the app get $100 of advertising credits. I'm not sure what that means.... At .2CPM, a business would get 500,000 impressions That would be a lot of page views for a small business. With the relationships that Visa has with local businesses, it is a giant entering the online local space. I'm surprised this isn't huge news all over the online local blogosphere. For those that follow academics: John Ousterhout is going to Stanford! I have immense respect for John. He's done great stuff. Instead of flying Southwest on a recent quick trip to the Bay Area, I decided to give Virgin America a try, even though I'm a pretty loyal Southwest flier. For the most part, it was a more pleasant experience. Convenience: Virgin flies to San Francisco (SFO) not Oakland (OAK). Because I was going to San Francisco, this was a lot more convenient. Planes: New planes and comfortable seats with fancy media services in the seat back -- satellite TV and games with Internet access coming. Gates: Very comfortable. In SEA, it's terminal A. In SFO, you fly out of the international terminal. Cool Factor: On VirginAmerica, it was a fun experience. It was like going to a night club or bar. If you are going to Las Vegas, I suppose you can get the party started early. I, however, was preparing to give a talk later in the day and I needed to get a business game face on -- so this, sadly, distracted me. 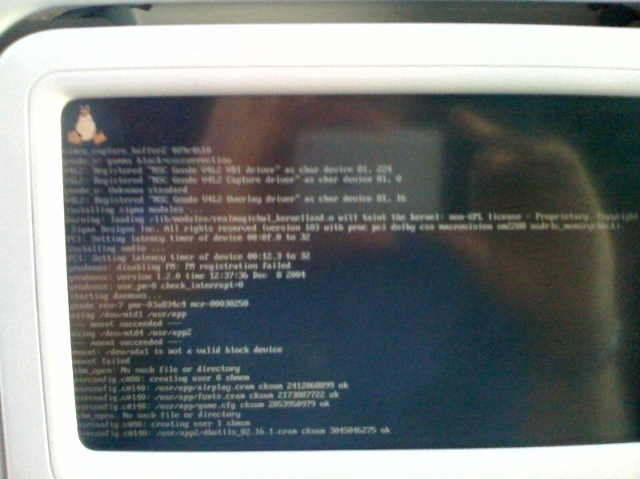 On the downside, the in flight entertainment system didn't work on my return trip -- it was down for the entire flight. I'm assuming they are still getting the bugs worked out. I found it a bit disturbing that immediately on touch down (literally, when the wheels hit the tarmac), the system tried to re-boot and failed. There's something about airplane computers failing (even though they are probably completely unrelated to the flight operations) that bother me. 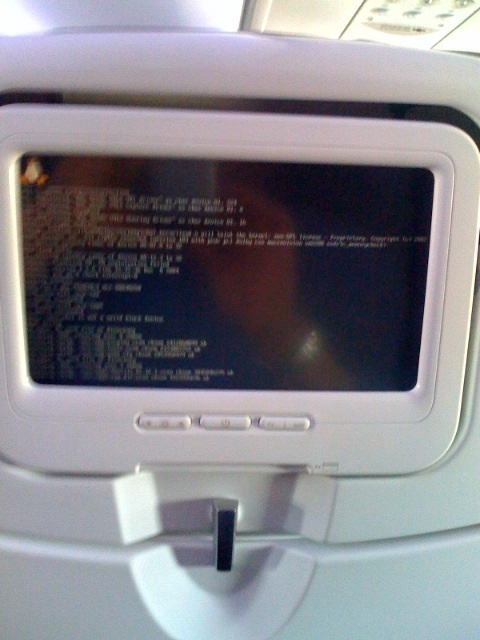 Maybe if they didn't display the root console on boot to the seat backs, I'd be happy in my ignorance. I hope they got that disk problem fixed. At least they run Linux. 10:46:35 ERROR 503: Service Unavailable. I'm talking to a lot of technology entrepreneurs these days. One question that frequently comes up is, "How do I know if my idea is good?" While this is a difficult question to answer, invariably, my answer always includes an assessment of market size. A good idea should address a large market -- preferably a mature industry ripe for disruption. After all, if you are going to jump into the risky business of doing a startup, the rewards had better be commensurate with the risk. "If it's high beta, make sure it's high reward," as Sharon Wienbar once said to me. If the market isn't very big, there isn't much to take. Sounds so obvious. As a corallary, disrupting an existing large market is even better. However, finding a large market to disrupt is often hard to find because you need to be "there" at the right time and place with the right idea. When Ben and I started MerchantCircle, we decided to attack the local Internet and we knew our customers were going to be local merchants (not consumers). However, it took us a few months to realize that it was the Yellow Pages industry that we were going to disrupt. The Yellow Pages business was/is mature, successful, and generating multi-billion dollars a year in advertising. And, yet, it was clear that consumers were abandoning the phone book for the Internet. Figuring this out was key to how we focussed the company. Today, is it really "news" that "Telephone book companies are heading for a long slow decline?" Well, at least it gives affirmation of our approach, a few years later. This seems so obvious in 2008. Nonetheless, we have yet to see a runaway winner disrupting the lucrative Yellow Pages business. We've seen a few challengers come and go. As the successful Yellow Pages businesses continue to grapple with their "Innovators Dilemma," someone will "crack the code" in this space and send the Yellow Pages down the path of music labels and newspapers. Hopefully, it will be MerchantCircle. As an entrepreneur, I'm bullish on disruption -- go big and transform an existing/successful/mature industry by disrupting it. Or go home and do something else.